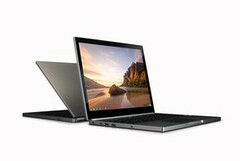 Google's Chromebook Pixel was first unveiled last month, debuting with a 2650x1700 pixel touch-screen display and running Chrome OS. The Wi-Fi version of the Pixel was made available immediately, but the LTE version's shipping date was unknown till now. According to the Play Store page for the Pixel, LTE-equipped versions will ship by the 8th of April, with pre-orders coming in at $1,449 (compared to $1,299 for the Wi-Fi model). Verizon takes care of the actual connectivity for the device, which also sports a dual-core 1.8GHz i5 CPU, Integrated Intel Graphics and 4GB of RAM. Although the Pixel is limited in its physical storage due to a 64GB SSD, Google does include 1TB of cloud storage for 3 years, a $1,800 value. Chromebooks have been on the market for a while now, as Acer, HP, Samsung and others all provide their own versions with mixed success. 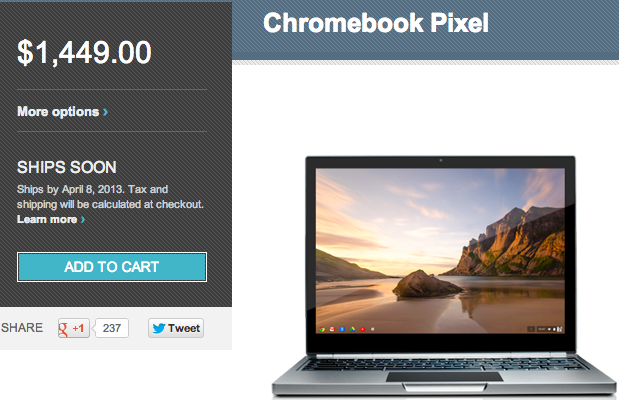 Nevertheless, Google apparently has great faith in the Chrome OS platform and it will have to be seen if consumers all willing to purchase a premium-grade, but expensive, Chromebook.